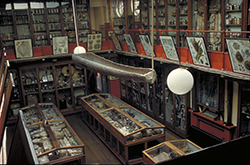 The Museum of Economic Botany opened at the Royal Botanic Gardens, Kew in 1847. As a display of useful plants and their products, it met two very Victorian aims: to be a bridge between producers of raw materials around the world and manufacturers in Britain, and to educate the public. Throughout its existence (1847-1987), the Museum grew to fill four large buildings. Today although the collection has grown to 100,000 plant raw materials and objects, including 1700 from Australia, these are in a research store. The very existence of museums of economic botany is mostly forgotten. This talk will explore how their history can be used to shine a powerful light on colonial history, and how historic specimens can take on new functions relevant to the modern world. It will draw on findings from The Mobile Museum: Economic Botany in Circulation, a major research project that is mapping the circulation of specimens across international networks of exchange in the 19th and 20th centuries. Specimens arrived at Kew by way of a complex network of scientific and personal relationships with collectors such as Emile Clement and Ferdinand von Mueller, and with similar museums at Australian botanic gardens. A remarkable number of specimens received by Kew – over 50,000 – were sent on to other museums, resulting in complex journeys for many Australian objects. What is revealed is a rich history of colonial, scientific and personal endeavour over a formative period in the development of Australia. Mark Nesbitt is Curator and Senior Research Leader in economic botany at Kew Gardens, and a Visiting Professor at Royal Holloway, University of London. His research is focused on human-plant relations through time. After studying agricultural botany at Reading University, he moved into archaeological science via postgraduate study at the Institute of Archaeology University College London, spending 15 years investigating early agriculture in the Near East. He has been at Kew since 1999, developing research and teaching based on the remarkably rich holdings of Kew’s Economic Botany Collection. His work follows three strands. Plant materials are represented by a large project studying Pacific barkcloth (tapa cloth), in collaboration with Pacific communities, and a new project on papermaking in the Kew collection. Work on medicinal plants is centered on a reevaluation of the history of cinchona, combining archival sources and DNA and chemical analysis of ancient bark specimens. Wider work on the history of colonial botany includes the Mobile Museum project, unpacking the 19th century network of botanical museums, and research into Kew’s South American collections with indigenous collaborators in the northwest Amazon. Nesbitt has authored 85 papers and five books, including Curating Biocultural Collections, a standard handbook on ethnobotanical collections. He is visiting Perth as part of the Collecting the West project, based at The University of Western Australia and Deakin University.